Is there anything quite so comforting as a childhood favorite? How 'bout the fact that you can make a dish your whole family will gobble up? I know a goal for me has always been to make up some meals for the week in advance so that I can pull them out of the fridge or freezer when I'm in a rush or just don't have the time or energy to put something together that day. Although by the time a day rolls around when I need that made-ahead meal, there's not usually one there. Best intentions. Although I did find a way to make it a little more doable. Jane of Make-Ahead Meals for Busy Moms recently released a book by the same name! Jane was kind enough to send me a copy of her new cookbook to try and review. 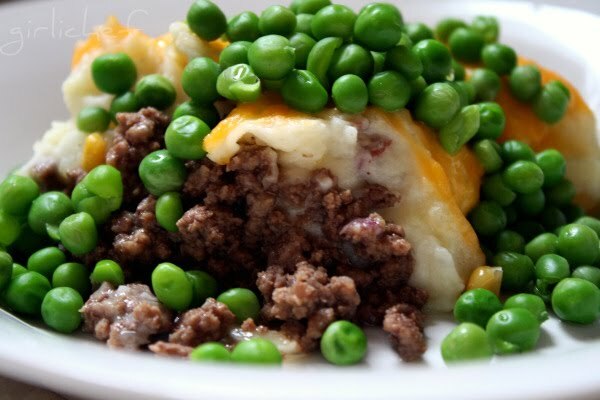 Although Taco Pie, Tuna Noodle Casserole, Sloppy Joes and Chicken Cordon Bleu and Cheesy Pasta, Ham and Peas all made it onto my list of must-tries from the book...Shepherds Pie was the recipe that ultimately earned its way into this post! Jane's book is all about turning favorite family recipes into "make-ahead" recipes so that her family...and ours...can get something healthy and home made onto the table instead of resorting to quick and unhealthy in our busy lives. Surprisingly, using a little of our spare time to create meals in advance can save us time and money....and sanity, if you ask me. I found that Jane's recipes are easily doubled...and are all very family friendly. And while I love a good challenge...something gourmet and unusual...I equally love simple, flavorful dishes that are reminiscent of my childhood and that the kiddos will eat without countdowns and threats of no dessert for the rest of their lives. This book fits that mark perfectly! I think in the past, whenever I made Shepherds Pie, it was basically a meatloaf with mashed potatoes on top. Jane's version is a little different...looser meat on the bottom and an added layer of creamed corn (something I hadn't used in mine before)...but simple and delicious and a new version that I will make often! In a large skillet over medium heat, brown the beef and onion together. Drain well and season with salt and pepper. Place the beef mixture in a 9x9x2" baking dish. Set aside to cool. Meanwhile, boil the potatoes in a medium pan for 20-25 minutes. Drain the potatoes and place them in a large mixing bowl. Add the cream cheese, butter, milk and pepper. Mix on medium speed until smooth. Pour the creamed corn evenly over the beef mixture. Spread the mashed potatoes evenly over the corn. When the potatoes have cooled, cover with foil and refrigerate until ready to bake. Remove the dish from the refrigerator 30 minutes before baking. Preheat the oven to 350 degrees F. Uncover and bake for 35-40 minutes, or until the corn is bubbly around the sides. This is a delicious basic recipe...but of course it is open to interpretation. If you want to add different seasonings, by all means do...they would fit right in! 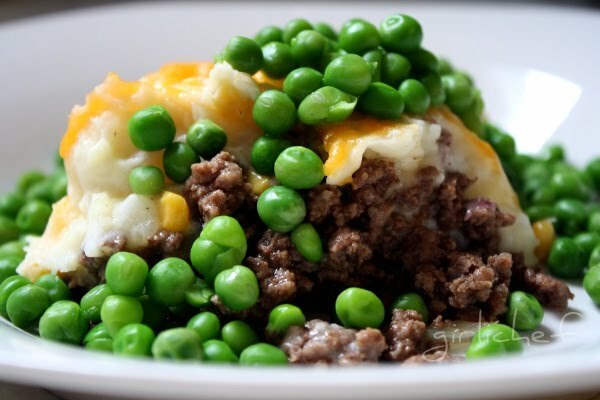 I added a little garlic to my potatoes, melted cheese on in the end and added hot peas...because I love peas with my meat & potatoes. Delish!